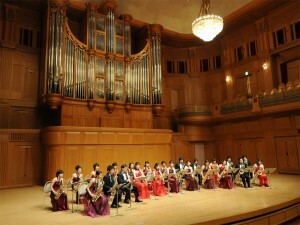 A mythical ensemble of 25 professional saxophonists from Japan specialized in the interpretation of famous classical pieces. In 1989, a group of dedicated professional saxophone players got together under the direction of Masahiro MAEDA to pursue the new way of interpreting the classic music. He created the ensemble of twenties of saxophones, having been inspired by his study in the Conservatoire National de Lyon, France. The dynamic sound and the perfectly balanced harmony its twenties of saxophonists create are reminiscent of an orchestra. The Ensemble has performed many concerts since its establishment, in Japan, Europe, Asia and North America, including the Carnegie Hall in New York City. They have played not only in the big concert halls but also in the church, in the park, in the wine yard, closer to the audience. The Ensemble has released more than ten CDs as well. Their video on YouTube has got a lot of glowing praise. Today, Mi-Bémol Saxophone Ensemble is recognized by the public as the most unique ensemble in the world.